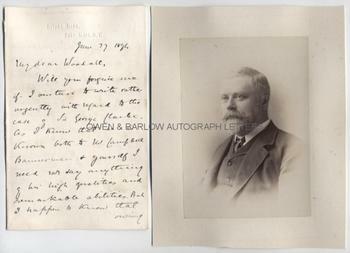 SIR THOMAS WEMYSS REID Autograph Letter Signed. British (English) journalist, newspaper editor, biographer and novelist. ALS. 4pp. Reform Club, Pall Mall, SW. June 27th 1894. To W[illiam] Woodall. Together with a fine portrait photograph. "Will you forgive me if I venture to write rather urgently with regard to the case of Sir George Clarke. As I know that he is known both to Mr. Campbell Bannerman and yourself I need not say anything of his high qualities and remarkable abilities. But I happen to know that owing to his domestic circumstances the prospect of having to return to Malta is extremely painful to him. It means in his case separation from his wife and daughter during the whole term of his residence on the island. There are other things, too, into which I need not enter, that make him most anxious if he possibly can, to remain at home. In these circumstances it would be a great thing for him if he could obtain such a position, for instance, as the vacant Superintendantship of the Powder Factories. Do you think that anything could be done for him. I, and all his friends, would be extremely grateful to Mr Campbell Bannerman if he could see his way to giving Sir George some work at home. Wherever he may be I know that he will be an ornament to the service." 8vo. Approx 7 x 4.5 inches. Slight mounting traces to right edge of last leaf, else fine. The portrait is a fine 19th century silver print photograph measuring approx 5.75 x 4 inches (excluding mount) laid down on card from an album leaf. It shows Sir Thomas Wemyss Reid in head and shoulders vignette. Mounting traces to verso but photograph is in fine condition. Sir Thomas Wemyss Reid became chief reporter on the Newcastle Journal when aged only 19. He went on to edit the influential and powerful Leeds Mercury. During this time he won the right for provincial newspaper reporters to be admitted to the press gallery of the House of Commons. In 1887 he became manager of the London publishers, Cassell & Co. From 1890 to 1899 he was editor of the Liberal magazine 'The Speaker', which he founded. Thomas Wemyss Reid also wrote several biographies (including those of Charlotte Bronte and W.E. Forster) and was a moderately successful novelist. Sir George Clarke, the subject of this letter, was an army officer and colonial administrator. He was, at this time, Governor of Malta. He went on to become Governor of Victoria and was the first secretary of the Committee of Imperial Defence. After his term as Governor of Victoria he was on the Committee that issued the Esher Report and, despite the glowing tribute given by Thomas Wemyss Reid in his letter, a biographer of the Esher Committee described Clarke as "an insensitive, clumsy, uncouth and infinitely boring man". Clarke was given the task of planning British coast defences overseas and his book on fortifications was influential and vindicated by the experiences of trench warfare in WW1. Both the letter and the photograph are from a 19th century collection made by the radical Liberal M.P., William Woodall, who was Financial Secretary to the War Office whilst Campbell Bannerman was Secretary for War.